This time.. the author will discuss about how to overcome the damage to the audio power amplifier, where the damage is marked by the "ticking" sound sound symptoms after the amplifier is turned off. The "ticking" sound is heard a few seconds after the off button is pressed. 1. The voltage at the measuring point (+) - (0) - (-) is unbalanced. Check each polarity using a multimeter. The cause could be due to an unbalanced transformer secondary voltage or the capacitor is damaged or unbalanced power supply load (amplifier power supply). 2. The polarity error (+ / - is, reversed) on the speakers, including the crossover system. 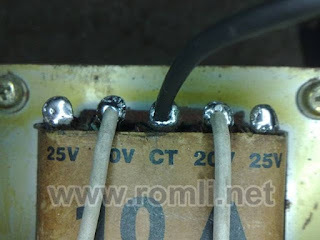 3. incorrect in taking the zero point (ground) power supply for tone control. Try to move the zero point (ground) for tone control to another main power supply point. Find the other best points. Hopefully the above ways can help the reader overcome the damage to the audio power amplifier which is marked by the beep sound after turned off.